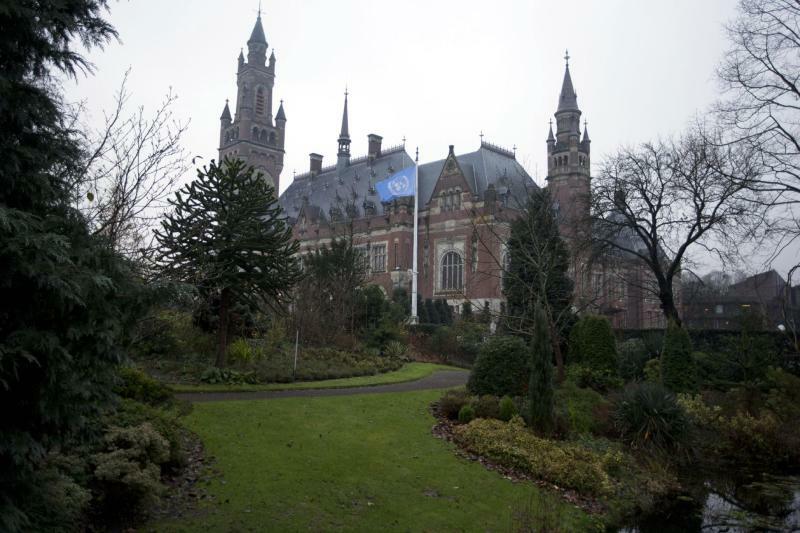 THE HAGUE, Netherlands (AP) — The United Nations' highest court was ruling Monday on a dispute between Peru and Chile that centers on thousands of square kilometers of ocean and lucrative fishing grounds but has turned into an issue of national pride for the Latin American neighbors. The International Court of Justice decision is expected to establish which country owns some 38,000 square kilometers (14,670 square miles) of ocean in a zone extending to the limit of each country's territorial waters. Peru is seeking recognition of a maritime border perpendicular to the coast. Chile insists the border is on a line horizontal to the earth's axis. The disputed zone includes one of the world's richest fishing grounds, with an annual catch of US$200 million estimated by Peru's fishing industry. The bulk of the catch is an anchovy species that is mostly converted into fish meal, which can be used in animal feed and fertilizers. But, for many, the case launched in 2008 by Peru is a matter of national pride. Chile seized its three northernmost provinces during the 1879-83 War of the Pacific from Peru and Bolivia, which lost its only coast in the conflict. Former Peruvian President Alan Garcia, whose government brought the case before the Hague-based court, has urged his countrymen to fly the flag on Monday and employers to let people await the judgment at home. If Peru wins, some 2,000 Chilean fishermen fear they could lose their jobs. Fishing companies such as Corpesca, which is based in the Chilean port of Arica, would suffer lost revenues. After Peru, Chile is the world's No. 2 exporter of fish meal. Chile's interior minister, Andres Chadwick, said he'd await the verdict in Arica in case of disturbances. Yet the actual border area has long been a model of coexistence. Citizens of both countries travel freely between Arica and its Peruvian sister city of Tacna, both of which depend on the fishing industry and on each other. Chileans crowd into Tacna's hospitals and clinics for the cheaper health care, while Peruvians work construction and other day jobs on the Chilean side of the border. Arica's mayor, Salvador Urrutia, says some 5,000 people a day cross the border in both directions. Rulings by the court are final and binding on both countries. The presidents of Peru and Chile have each said they will adhere to whatever decision the court makes. The countries are partners in a number of important regional and Pacific economic alliances and have seen annual bilateral trade grow from $500 million in 2006 to $4.3 billion today and each had significant investments in the other in sectors as diverse as tourism, retail and gastronomy. Chilean government figures put Peruvian investment in Chile at $11 billion last year with Chile investing $13.5 billion in Peru. Eva Vergara in Santiago, Chile, and Franklin Briceno in Lima, Peru, contributed to this report.